Today I baked this Egg-less Vanilla sponge Cake for evening snack. Though I had baked this cake so many times before,it has never made it to the blog. But today I made sure that I clicked some pictures before we ate the cake. Also I didn't apply any frosting, just enjoyed the cake as is. But for special occasions this cake can be used as a base and can be frosted and decorated as you desire . 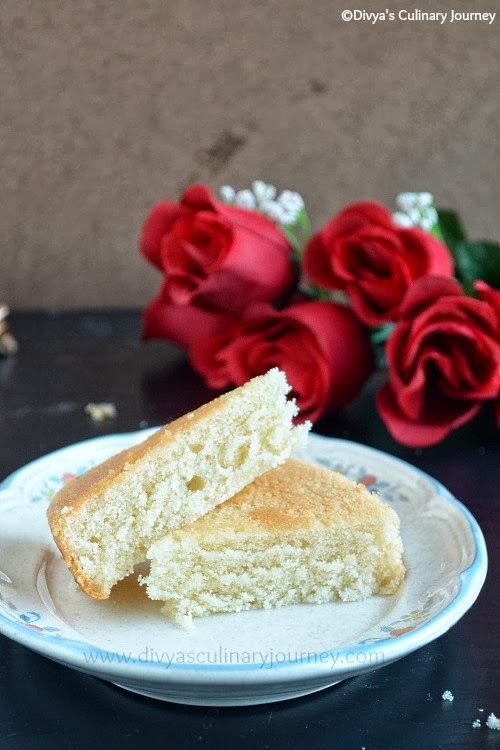 I have posted Basic Vanilla Cake with egg version earlier. In fact it is my first blog post.And also I have posted Vanilla cupcakes with rose flavored buttercream frosting. If interested do check it. 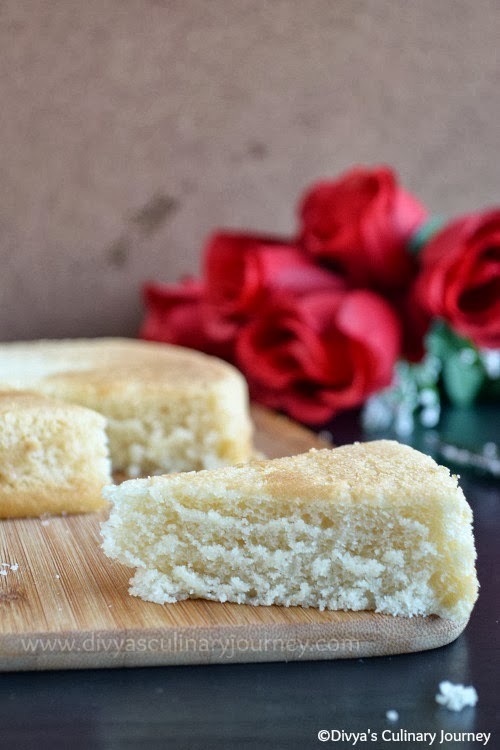 Coming to today's recipe- Basic Vanilla Egg-less Sponge Cake. Prepare 9 inch round cake pan by greasing and flouring it. In a bowl, sieve together all purpose flour, corn starch and salt and set it aside. In another bowl, mix together yogurt and sugar. To it add the baking powder and baking soda and mix well and set it aside for about 5 minutes till it starts forming bubbles. Then add this mixture to the flour mixture along with oil, milk and vanilla extract and mix well. Pour this batter into the prepared and pan and bake for about 30- 35 minutes till the toothpick inserted in the middle comes out clean. Let the cake cool for about 10 minutes and then remove from the cake pan and let it cool completely. Then you can decorate the cake or slice and enjoy!! It yields a 9 inch round cake. Yogurt and milk has to be in room temperature. I used 3/4 cup of Sugar and it was mildly sweet. So adjust the sugar as per your personal preference. If you have a sweet tooth, then add 1 cup of sugar. Baking time varies with oven to oven. Mine took around 35 minutes. Check yours accordingly. If the cake is not perfectly baked (tooth pick is slightly sticky) then cover the cake with silver foil, lower the oven temperature to 325 F and bake for another 5 minutes. Omg thats a super spongy and fantastic cake there :) looks super moist and delicious !! :) love to grab a piece now ... very very well presented and lovely clicks !! I have been searching high and low for an eggless cake. And I have stopped after seeing your recipe. My few attempts on eggless cakes been disasters, not sure why. I am gonna try this spongy and inviting cake for the next weekend. Looks super moist and delicious!!! Lovely snaps Divya and the cake looks so crumbly and delicious. super eggless cake.. lovely click! super sponge cake... looks awesome..
Soft, spongy and delicious cake, beautifully presented. 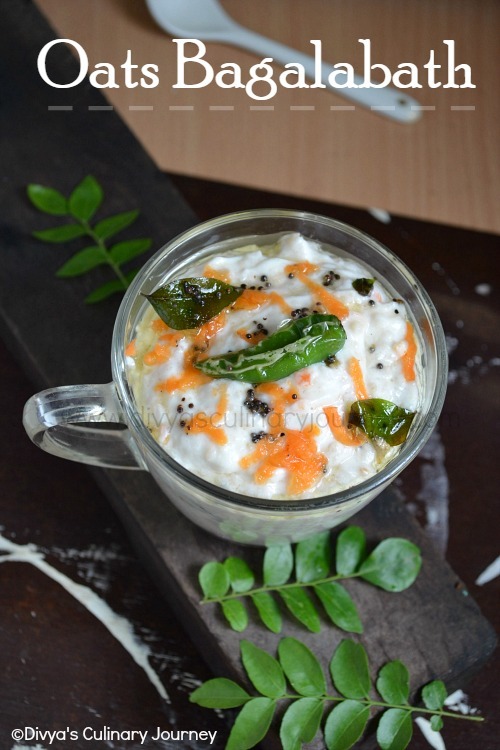 Looks so delicious and spongy Divya. Wow beautiful texture,soft too good. Simple and really amazing.Looks damn soft. 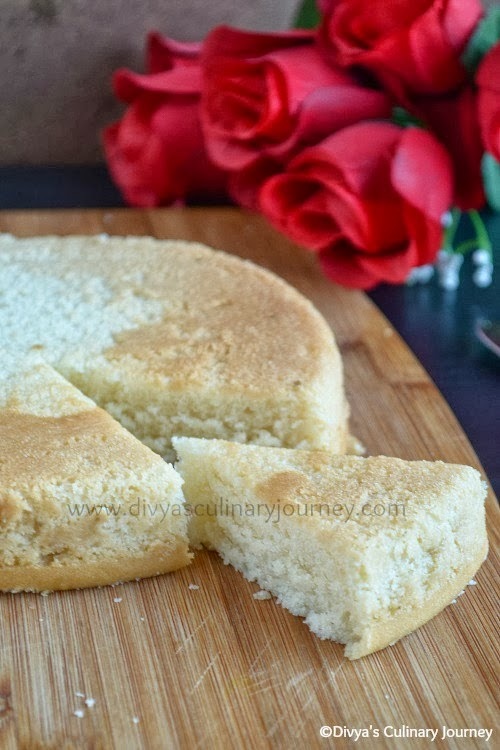 that's so moist and real spongy cake..looks so delicious, lovely clicks Divya! 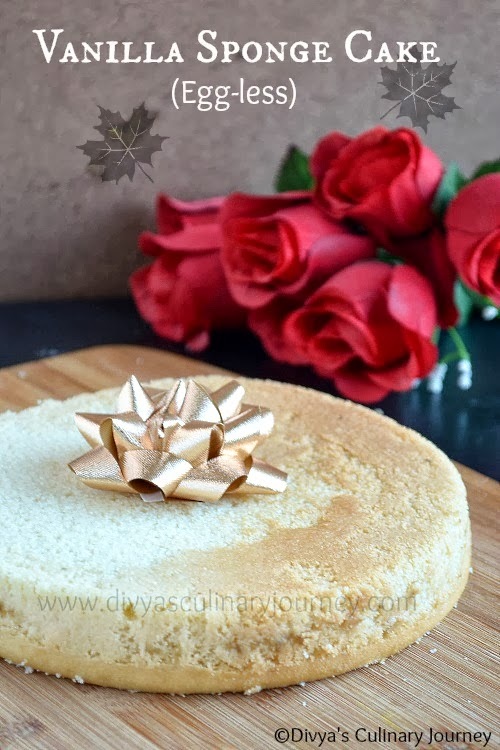 Very moist and super spongy vanilla cake.. I loved your cake awesome.Thank you for shared it! My daughter is allergic to eggs and I was bummed she wouldn't get a birthday cake but then I found this! Turned out great! Thanks so much! I gave this recipe to my 9 year old daughter and she made it nicely.I helped her only to preheat the oven and put the pan into the oven.